I followed your advice and kept on working with St. Expedite. However, at the time of getting the agreement for the land I was hesitating to give him his offerings. We had three flat tires. I had one and my husband two on the highway. It was so clear to me that he was angry, so the day after, I got his offering: red flowers and a butter cake and I honoured him. After this everything went smoothly. I never worked with this Saint before so I would like to warn other co-workers to be carefull. Give what you promised. The only thing is that he sometimes gives better but in another way the things you asked. After the land I started some candle work for my job. On my petition I asked for my dream job. I explicitly stated how the job would have to be like. And he heard my prayers. Suddenly I got 4 job offers and the one I wanted was one of them. At a certain point I started doubting myself, so I would like to thank St. Expedite with his help in my finding my job and healing my prayers. He is an awesome Saint. Next year when the land is ours I will plant the flower bush. Thank you for your advice, Miss Cat. Thank you for the updates to your spiritual work. Saint Expedite is indeed widely known as happy to "expedite matters," and at the same time for "punishing" those who fail to honour their vows to him. The warning is well-deserved, and i am very happy that everything has been working out for you. You are right. You have to be careful when making promises to St Expedite but he is such an awesome saint. He is so able that I have to come here again to give him thanks for hearing my prayer. My vigil candle had a very dark sooty burn and a thick layer of wax at the bottom which I thought was a no go, but he still answered my petition literally as soon as the candle went out. I love love LOVE st Expedite! Hi, I have ordered to have St Expedite glass candle vigils lit on my behalf but have had a read of this forum about paying him asap if he comes through otherwise he can punish and take everything away and more. If I have ordered the candles for him to be lit on my behalf do I still set up some sort of altar to pay him with roses and cake? or do I just give public thanks to him? I don't want to do the wrong thing and look like I'm not paying him even though I'm using a rootworker to do the candles. Yes, it is the custom for the one who is helped -- whether remotely or at the altar -- to "pay" Saint Expedite. Publishing your thanks (on the internet) is sufficient, but he does like his cake or a floral tribute. An interesting bit of advice that some of H. M. Hyatt's interviewee's suggested was to provide Saint Expedite (Saint Esspedee) with a hammer and a nail. I started doing this on my St. Expedite Altars for my clients, and it really does seem to help. Thank you Saint Expedite for your help! I hope you enjoy the flowers, the water and the lemon pound cake. Please, come get the cake before Rogue the beagle pup steals it, again. Thank you St Expedite for the unexpected financial boost I needed this week! Thank you also for your help With my other petitions! Thank you St. Expedite for your blessings in aiding me in being approved for my first apartment!! Lord knows it's long overdue for me and I so desperately need peace and quiet and peace of mind from my family situation! I will continue to praise you to the world!! Thank you Saint Expedite! I wanted to give gratitude to Saint Expedite for coming through for me for the first time by answering my prayer and petition. I am forever thankful that he granted my petition very quickly. I promised you pound cake, a red flower and spreading your name with love and honour. Let this be a start to spreading your name with love and honour and tomorrow I will grant you the pound cake and red rose I promised you. Thank you St. Expedite for the unexpected money this week. I will pick your pound cake up today. Thank you Saint Expedite for helping with my boyfriend's new job! You would likely want to get a reading from an AIRR worker or even Miss Cat to answer specific questions and rootwork. As for the situation you can freeze the lawyer in a tongue to shut him up. You can let him know of the agreement and you will report him to the State Bar association and Attorney General. You can pray to God for protection and prevent from being scammed. You can use commanding products on him as well. I am not sure if St. Expedite would be the best saint for protection, he does things fast. St. Michael is more protective. Thank you St. Expedite for coming through for me. It may not have been exactly what I asked for, but it was what I needed! A huge thank you again to Saint Expedite! I prayed for something a few weeks ago and I thought he was telling me no, but yesterday my prayer was answered! And my prayer from a few days ago was answered immediately. St. Expedite you are amazing! My most humble and gracious thank you St. Expedite! You came through for me in the most amazing way! Thank you, thank you! Today I felt led to give St Expedite a small sweet treat and a candle just to say thank you for the trusting relationship we have built. I’m wondering if I had done the wrong thing but I felt led to do it as he has helped me with so much before and is currently. I made it clear that it was just a treat not a payment. What if I have more than one request for Saint Expedite? Example I was going to petition to pass my nursing exam for license. And I also need money to pay off debts? I was going to do them two separate week but how do I go about leaving an offering from one and it not be mistaken for the other request? Also, I can arrange my test date around when I’m going to petition Saint Expedite. I understand his day is Wednesday. Should I make my test the following Thursday or Friday? Or does it not matter how far in advance the petition is? Any advice is appreciated thanks! I would work with one request at a time and see if he is willing to work with you. Leave an offering when he answers the work you asked about. I dont think it matters necessarily but it makes sense if time is an option to ask with some time between the need of the request. He is the saint of fast quick responses. I would also consider doing a crown of success along with this to make you successful for the test. Hi All! I just had to cancel an appointment and there are NO present appointments available until January. I know St Expedite is for fast results, but would he be appropriate to work with in this case since the appointments are hard to get? Or should I work with him and another saint? Thank you! You can work with him sense its a fast quick need, or you can petition st jude if its a difficult appointment to get. So perfect!!! Thank you JayDee! 1. 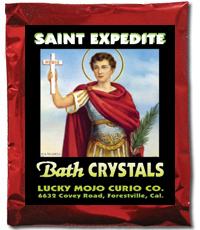 Should I still "gift" Saint Expedite even though my original request wasn't fulfilled? I feel driven to thank Him bc like I said, there is slight improvement. 2. Is there a specific color of candle I should use for financial prayer? With my original request, I used a green candle - not sure if that matters. 3. How long after the date/time I give Saint Expedite should I still allow the candle to burn? The date I originally gave Him was October 31 but I allowed the candle to burn until it went out on its own which was this morning, November 2nd. I do apologize in advance for the "newbie" questions, I'm just trying to learn the correct way to go about this. I thank you all in advance for your time, patience and I look forward to the awesome answers I receive. Have a wonderful day and weekend! 1. This question has been debated by many on the forum. I always paid him as my family taught that he would punish you. Others say no only pay if he gives exactly but then you must pay him or he punish you. Since you feel a slight improvement happened maybe give a little something as an offering. But again people differ in this opinion. 3. Working with Saint candles is called a novea and its a prayer usually done over several days. Common novea is 7 but they can go longer. Let the candle burn out, then look in the wax for signs to the work: wax wax left, did the glass have marks on the sides, did you see smoke or haze in the glass? It indicates the issues at hand. You may also be interested in working with St jude with difficult situations. Thank you JayDee for your awesome response! The glass of the candle had smoky looking marks on the sides. What does that mean? Thank you for the links JayDee! I stayed up late last night reading them. Because of the lack of finances, when I originally petitioned Saint Expedite I used a fairly cheap candle but before lighting it I cleaned it with Florida Water, let it dry then dressed it with money drawing oil. I'm not sure if that was the correct way to do it or if that somehow affected the overall outcome. Once again I thank you for your help and very thorough, great responses! A candle is usually just wax, a vehicle or base for the work, but properly made money drawing oil does contain herbs and minerals of folkloric magical import. It is unlikely that a saint such as Expedite, who has helped many when they had no more than a red tea light, his holy card and a red geranium flower, would frown upon the offerings of the poor. I love him. He is a great spirit and has brought me far. Yes, Ms. Catherine - I've read alot about how amazing this Saint is when He does come through (thanks to the amazing posts on this website). I appreciate your response and of course, the responses from JayDee as well. You all have been so kind to this curious newbie and it is very appreciated blessed day and I will try again! Lucky7clover and Mary Bee, I agree. I’m starting to believe that Saint Expedite will only help you with what you really need. On Saturday I petitioned him for some money and I honestly knew the amount I asked for was more than I truly needed but I added a “buffer”. He gave me a solution to get it but I didn’t want to get it that way. It’s my fault because I forgot to say how I didn’t want to get the money in the petition. I thanked him anyway and gave him his reward. An hour ago I realized I needed to go to the grocery store which I did NOT want to do because it’s raining but something told me to go anyway. As I put on my coat I randomly smelled Saint Expedite incense but I didn’t have any burning. Then as I left I had a flashback to a time I found money on the ground. I promise you, less than 30 seconds later I found the same amount of money as I did in the flashback on the ground again! Thank you St Expedite for your gift last night — it truly was a monetary gift in a completely unexpected, but very much needed and substantial credit line increase notification that was quite a surprise, I had not even asked for it. I will be buying some red flowers this weekend! I prayed to Saint Expedite for money and he brought me the next day. I hadn't even set up an altar. I made him cake and gave him rum to thank him. After that I asked fora specific amount of money in a month and he gave me more than that and I dont even have a job. He gave me the money unexpectedly. THANK YOU St Expedite so much. I hope you enjoyed your cake and I will give you the flowers asap. Forgive me if I did anything to offend you. I hope I will have you by my side and you will bring me luck and happiness soon as you like to do. Glory to your name. Thank you. I would like to ask you if anyone knows if I can work with St Expedite and St Martha (the black one) at the same time. I worked with St Expedite for money and with St Martha Lubana to bring me back a lover. She brought him back and we were together and St expedite gave me the money. Also I asked saint martha now that we are together and happy to make the relationship more serious and to make him tell me to move in together and I asked St Expedite for help as well tomake it faster. but all of a sudden the boyfriend started behaving badly and now we have no contact for 2 weeks. I wonder if St Martha or St Expedite may be offended because I asked both of them? I asked them to forgive me, put their altars in separate rooms and burnt a candle for each for forgiveness. Also I asked St expedite to just help me with money because I am pleased in love with St Martha and sorry if I offended them. Now what I can do? Welcome to the forum! If you get a chance, and wish to do so, please introduce yourself in the Introductions thread. You were getting success with St Expedite for your money goals, so continue working with him for that. St Martha already helped you bring your man closer to you, so continue working with her for that goal. I would keep these two objectives separate and let each saint help you in their own way. If you feel you have offended either or both, apologize and ask for their forgiveness, then make an offering. Be sincere and you should be fine. Thank you St Expedite for providing me with some money and a means to make some extra money (although nowhere near what I needed in my emergency and unfortunately the extra work was what I specifically prayed for that I really did not want to have to do for extra money but I am still grateful as you still responded) I hope you liked your red flowers and cake. Thank you St. Expedite for coming through when my family needed you most! Honor to the speedy saint! Thank you, thank you, thank you! I got my package from Lucky Mojo! Problem... I just realized I don't have a red candle for St.Expedite. I really need to do this conjure. I need to bring in some $$$ fast. I have, orange, purple, white, green, and pink (I'm saving the gold one for when I order my money herbs). Can I use any of these or shall I run to the store tomorrow and get red? You can use a green candle when petitioning Saint Expedite for money,and white is good for any kind of a petition. I want to publicly thank Saint Expedite for coming through for me once again! He didn't give me what I had asked for; he gave me something even better! What I thought I wanted wasn't what I actually needed and now he has put me on the path to where I actually belong. He knows that I belong in Miami to further my career! I will be giving him his offerings of pound cake, water and flowers as soon as possible! I'm so happy right now! Thank you Saint Expedite for coming through once again. You are the best! (I just want to remind you guys I am posting for nt friends) she is in debt and is need for money and money for groceries savibgs accountdor herself and more I am embarassed to type the amount of money she wants because I think it is impossible she has wintergreen oil cinnamon stocks olive oil st.expedite photo and a 7 day red candle and needs the money by Thursday I read he moves fast so I suggested the photo she also has a white candle but it's small can she use both candles the same day for money or what can she do with these items she has? Your friend can burn the red candle and pray to St Expedite to help her with her financial situation. Wintergreen is used for luck so if she would like to receive some money through lucky means, then she could add that oil to the candle, otherwise leave it out. Have her also ask the Crystal Silence League to say a prayer for her. This service is completely free. I hope this helps. Good luck to your friend! Thank you, does she have to dress the glass area? Or put it inside on top? Will he for sure grant her the money the thursday if she does it the wednesday? She can put it on the top of the candle. There is no guarantee that any spell will work, much less work by a specific date. All she can do it work her candle, pray with her heart and trust in the outcome. I'm not sure if St. Expedite worked. I asked for money for a specific thing. The money I got was waaaaay off. Like $650 less than what I need. I don't know if I should pay him or not. Do the flowers have to be fresh? Can they be artificial? Some weird stuff has been happening. I'm wondering if it's St.Expedite. I would still thank St. Expedite for providing what he did give, and I wouldn't skimp on the flowers--get the real ones! Nothing bad will happen, unless he disturbed the spell or extinguished the flame. As long as it's still burning, the work continues. It's really only mojo bags that we want to keep hidden from the view of others. How long do I leave St. Expedite pound cake out? Do I give it to the birds or just lay it on the grass? Leave it out for St Expedite until it begins to dry then you can feed it to the birds. Thank you so much Saint Expedite for granting my request before your candle burnt out. You really are amazing! I rely on St. Expedite on a daily basis and have him permanently enshrined, he never lets me down.The only reason I am able to walk and walk reasonably well is because of St. Expedite. The gist of this post is that I think there are better ways of acknowledging St. Expedite's help publicly rather than the methods commonly employed and that by using these more effective methods *YOU* will receive superior results from working with Him, as He will surely reciprocate. I could be wrong but I believe that most people post their acknowledgement/experience on an occult forum like this one, Lucky Mojo and/or post on a website dedicated to St. Expedite and while there is absolutely nothing wrong with doing this, I believe an even better way exists which helps St. Expedite out AND WILL SIGNIFICANTLY IMPROVE *YOUR* RESULTS FROM HIM. Trust me when I say that He notices pretty much everything about how you approach Him, I have learned much about St. Expedite by working with Him on a day to day basis for several years now. (For instance, He likes much more than pound cake, He greatly appreciates a VARIETY of different deserts, chocolate brownies, banana nut bread, blueberry cupcakes etc....). A combination comprised of posting on occult sites/dedicated sites/social media plus retail sites should really yield better results and is a win/win for *YOU* and St. Expedite. Let me elucidate: Retail sites have many vistors on a daily basis. So why not post your actual Positive experience on these sites, where St. Expedite will get so much more visibility? 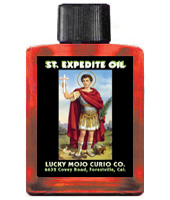 Say you purchase a plain red 7 day candle from Lucky Mojo, why not work your Positive experience with St. Expedite into the review of the plain red 7 day candle itself? This methodology can be used with any of the paraphernalia associated with St. Expedite: candles, pictures, statues, prayer cards, books, and so forth. Why not work your Positve experience with Him into your product reviews? If you really want to go all out, you can SUBTLY work your Positive experience with St. Expedite into products not normally associated with him, if you honestly prayed to him while using those products. So by all means, use product forums and dedicated religious sites along with social media, but please ALSO use review sites for any product with which you truly said a prayer to Saint Expedite as well. I believe this method has great and untapped potential visibility. Of course visibility is highly affected by the item one is reviewing, so while you are mentioning St. Expedite in reviews of high visibility products, please don't spam review sites for goods that have no connection to St. Expedite. There are many people that know who St. Expedite is, but there are vastly more who do not and these people can be reached with just a little work; you will be doing them, yourself and St. Expedite a huge favor. And just imagine how good your results with St. Expedite will be if you help him out this way, He will give back much more than you could possibly give Him. My personal results have skyrocketed, two vexing health issues (Chest Lump and Testosterone Deficiency) which doctors could not adequately resolve have been greatly ameliorated due solely to His rapid intercession, I kid you not. And please, write a short personal anecdote of HOW St. Expedite helped you, not just a quick "thank you" which is seen all too often. This step is quite important for obvious reasons. Thank you for making it this far and happy spell-casting no matter what you decide to do. Hello, ss108, and welcome to our forum. I like your idea a lot, and i think that as long as you do not spam forums or review sites with irrelevant mentions of Saint Expedite, you will accomplish what you desire, which is to magnify his name. 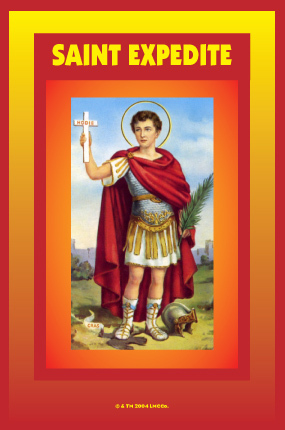 St. Expedite brings luck in a hurry; light his candle on a Wednesday for quick results. Which is why I emphasized "SUBTLY". We want to honor the Saint in a befitting manner, most critical. It's great you brought this up, I should have spent more time on it.